Styrene Polymer Removal - ARCO Chemical Company Case Study | Pollution Control Products Co. Cleaning the condenser and other parts has cut expenses dramatically. The primary cost for cleaning the condenser was for fuel, approximately $500 compared to a replacement cost of $100,000. ARCO Chemical Company's Beaver Valley plant in Monaca, PA, a manufacturer of styrene-based plastics, was experiencing severe problems and expense with the periodic cleaning of their large 20' long heat exchangers (condenser). During operation, they would eventually plug on the shell side with cross-linked plastic residues. Prior cleaning methods involved setting the condenser afire and letting the heat exchanger burn uncontrolled for several weeks. However, the extreme heat generated during burning frequently damaged or warped the condenser, especially the tube bundle, severely limiting its operational life. Additionally, the large amounts of black smoke generated during these burnings created safety and health issues. When the state regulatory agency for air quality would no longer permit open burning, ARCO had no suitable alternative, so the condensers had to be scrapped once they became plugged. At a cost of $100,000 per condenser, this indeed constituted a problem. 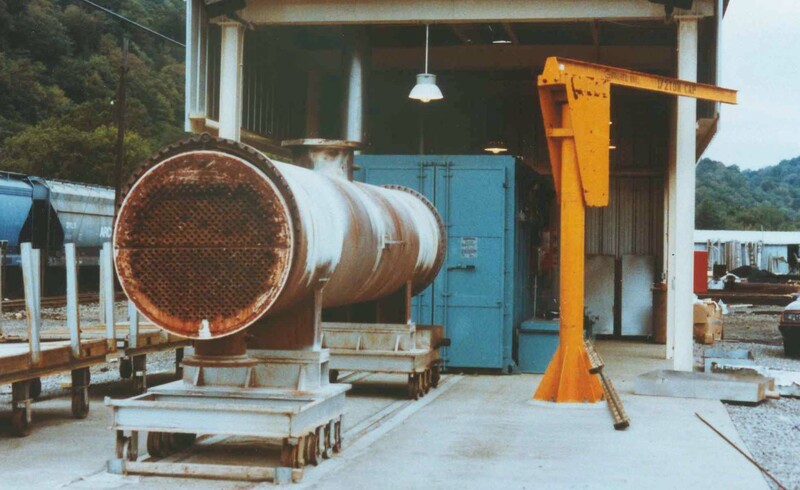 In September 1984, Pollution Control custom-designed a pyrolytic cleaning furnace big enough to house ARCO's 20' long heat exchangers. With interior dimensions measuring 5-1/2' wide × 7' tall x 22' long, the furnace was loaded by placing the condenser on two heavy duty dollies which roll outside the furnace for easy loading and unloading. During furnace operation, the temperature is first increased to a point where plastic material is allowed to melt and drain into a cool collection pan where the plastic solidifies and is removed. 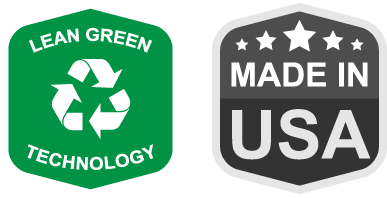 This feature allows significantly shorter cleaning cycles for metal parts because the plastic does not have to be vaporized. The furnace temperature is then increased to 800-900°F to safely decompose the remaining plastic into volatile pyrolysis gas and smoke in a partially inert oxygen-deficient atmosphere. The gases and smoke are then vented through two secondary combustion chambers operating at 1500°F incinerating the smoke completely, leaving only invisible, odorless and harmless carbon dioxide and water vapor to exit the exhaust stack. High efficiency direct flame incineration of the smoke is controlled at a rate of approximately 33 lb/hr by a patented emission control system. During start-up, a large condenser weighing 24,000 lbs. approximately 4' in diameter × 19-1/2' long was cleaned in the furnace. After 120 hours in the furnace, the cleaned condenser weighed 19,760 lbs. ; about 4,240 lbs. of styrene-based polymer was removed. After cooling, the condenser was removed from the furnace, the tube bundle was easily removed and undamaged. The unit was free of plastic except for small amounts of carbon around areas where air diffusion inside the exchanger was hindered. The cleaning operation within the furnace was completely automatic and only required periodic removal and replacement of the collection pans below the drain. The process eliminated both the clouds of black smoke and the safety hazard associated with open burning. The furnace is also used to clean other polystyrene-plugged parts. Frequently, smaller parts such as polymer pumps, extruder die parts, breaker plates, small condensers, condenser heads, and pipes up to 20' long required cleaning. For convenience in loading the smaller parts, two 10' long carts are used which are pushed in and out of the furnace. ARCO Chemical Company, a division of Atlantic Richfield Co.